Senior Nikoleia Paterakis decorates a tiny pumpkin during last year's contest. 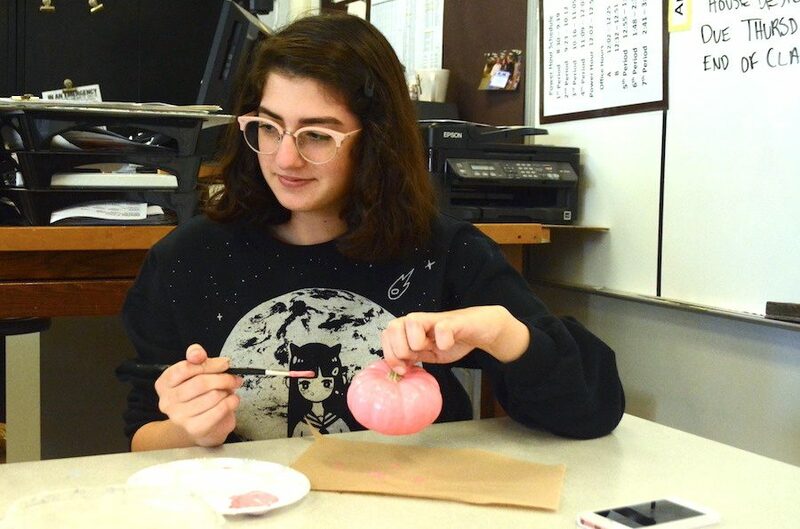 The National Art Honor Society is preparing for its annual pumpkin-decorating contest. Participants will have the chance to create their own design on a pumpkin, and afterwards enter their pumpkins to be judged and possibly win a prize. There will be a fee of $2 for entry to decorate. This event is set to take place Thursday after school in Room 5-100. Parent/teacher conference night also will be held Thursday, and parents are encouraged check out all of the designs. “Pumpkin-painting is a really fun way touch your artistic side and also be festive on Halloween,” club member Olivia Langford said. All of the proceeds raised are used for funding the club.